While Florida State holds an 18-8 advantage in the series, Clemson has won six of the last 10 and the last five played in a Death Valley. When No. 5 Florida State plays at No. 3 Clemson on Saturday night it will mark only the fourth meeting ever between two top-five Atlantic Coast Conference teams. With an 8 p.m. kickoff on ABC, all eyes will be on quarterbacks Tajh Boyd and Jameis Winston. Boyd has led the Tigers to a 6-0 record this season and 11 straight ACC wins dating back to a 49-37 loss at Florida State last year. The senior became the all-time leading passer in program history (9,836 yards) by passing for 334 yards against Boston College last week. Clemson is averaging 514.5 yards of total offense. Boyd has passed for 1,783 yards with 15 touchdowns and only two interceptions this season. Despite throwing for 237 yards and three touchdowns against the Seminoles last year, Boyd and the Tigers left Tallahassee with a bad taste in their mouth after a two-touchdown lead disappeared in the third quarter. FSU outscored Clemson 35-9 the rest of the way on its way to the ACC crown. The Noles tagged the Tigers with 667 yards of total offense, including E.J. Manuel's 482 all-purpose yards. Manuel may have gone to the NFL, but Florida State is certainly not missing a beat with the freshman Winston under center. Since his debut performance against Pittsburgh in week one (five touchdowns), Winston ranks as the most productive quarterback in FSU history through five starts. He's passed for 1,441 yards with 19 total touchdowns and ranks second nationally (213.94) in passing efficiency. Winston, along with the defense, helped lead Florida State to a 63-0 win over Maryland — tied for the largest margin of victory over a ranked team, tying when UCLA destroyed No. 11 Texas 66-3 in 1997. The FSU offense is averaging 549.0 yards of total offense this season, including a solid running game (228.2 yards per game) led by Devonta Freeman and James Wilder. With all of their success on offense, the Seminoles' (5-0, 3-0 ACC) defense enters this game ranked in the top 10 nationally in scoring defense (3rd), passing defense (2nd) and total defense (7th). The Tigers have continued to improve defensively, especially in scoring defense, allowing 16.2 points per game. They have also allowed 101 yards per game fewer than last season. 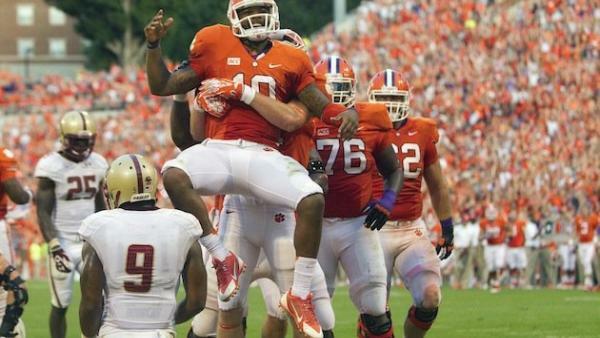 The duo of Tony Steward and Vic Beasley were instrumental in Clemson's 24-14 win against Boston College. Steward sacked quarterback Chase Rettig in the fourth quarter to force a fumble that was returned by Beasley for a touchdown. Beasley has recorded nine sacks in six games this season. While Florida State holds an 18-8 advantage in the series, Clemson has won six of the last 10 and the last five played in a Death Valley. The Seminoles last won at Clemson in 2001.